The 2009 to 2016 Suzuki GSX-R1000 is different from its predecessors, from its balance to engine specs there are a myriad of changes. Suzuki promotes the superbike as having total balance and the performance to exceed its biggest rivals when it comes to power. K&N has designed a new high flow replacement air filter, part number SU-1009 for the 2009 to 2016 Suzuki GSX-R1000 superbike. Our K&N air filter offers your Suzki the air it needs to respond with horsepower. 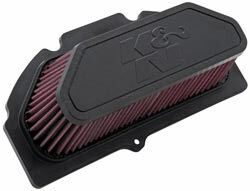 K&N air filters are designed to increase horsepower and acceleration while providing excellent filtration. This K&N air filter will fit in your Suzuki’s OE air box assembly. Do not remove the air filter o-ring in the air box. A deep, pliable application specific sealing bead ensures an air tight fit, without any cutting or fitting required. An injected molded base and a plastisol top plate ensure a perfect seal and long life. Once the air box lid is reinstalled, put the stock screws into the air box lid and tighten. Make sure the center screw is installed because it holds the motorcycle air filter in place. Fuel management modifications are not necessary to obtain increased performance. K&N invented the concept of washable reusable cotton air filters 40 years ago. Covered by our famous K&N Million Mile Limited Warranty, the SU-1009 will be the last air filter your 2009 to 2016 Suzuki GSX-R1000 will ever need.